Quiet and peaceful neighborhood surrounded by towering trees - just a 10 minute drive to Heavenly or Stateline (approx. 6 miles). Split-level home in Tahoe Paradise with recent upgrades including carpet, linens and kitchen items. 3 bedrooms, 2 baths plus a bonus room. Sleeps 8 with 1 king, 1 queen, 2 twins and a sofa sleeper in the bonus room. 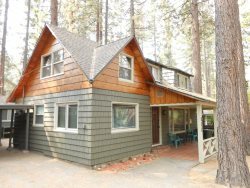 This is a spacious, comfortable family home with "upstairs living" so the living room, kitchen, dining are on the top level for nice views of the trees and Tahoe atmosphere. Fully equipped kitchen, cable TV & VCR, fireplace, linens provided, washer and dryer. No pets and no smoking. While we hope you and your group will have a memorable vacation, we cannot stress enough how important it is to abide by the City of South Lake Tahoe’s laws. Laws are now being enforced more strictly than before where citations will be issued to guests directly, and also to owners, with no warning. Citations are no less than $1,000. Please abide all laws especially those in regards to noise, occupancy, and parking. If the owner is cited due to an ordinance violation, guests who received the violation will be responsible in paying for the fines. You may also view all regulations and all information on South Lake Tahoe’s website, http://cityofslt.us/vhr.